1. This is not a credit card. 2. 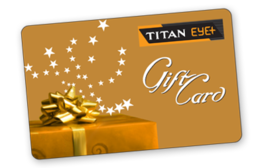 This card is redeemable for products and services at select titan eye plus stores. 3. This card cannot be redeemed for cash. The cash amount value loaded on the card shall be valid for 180 days from the date of issue. 4. Please present this card to the style consultant prior to billing for services or when you want to recharge the card. 5. If this card is lost or stolen, it will not be issued again. 6. Receipt for purchases made with this card will show the remaining card balance and validity.